Gillian Seagret doesn't listen to people who say her father's a crackpot. His conspiracy theories about the lost technology of Cold War-era rocket scientist Dr. Aloysius Underberg may have cost him his job and forced them to move to the middle of nowhere, but Gillian knows he's right and plans to prove it. When she discovers a missing page from Dr. Underberg's diary in her father's mess of an office, she thinks she's found a big piece of the puzzle--a space-themed riddle promising to lead to Dr. Underberg's greatest invention. Enlisting the help of her skeptical younger brother, Eric, her best friend, Savannah, and Howard, their NASA-obsessed schoolmate, Gillian sets off on a journey into the ruins of Omega City, a vast doomsday bunker deep inside the earth, . Gillian Seagret doesn't listen to people who say her father's a crackpot. His conspiracy theories about the lost technology of Cold War-era rocket scientist Dr. Aloysius Underberg may have cost him his job and forced them to move to a cottage in the sticks, but Gillian knows he's right and plans to prove it. When she discovers a missing page from Dr. Underberg's diary in her father's mess of an office, she thinks she's found a big piece of the puzzle--a space-themed riddle promising to lead to Dr. Underberg's greatest invention. Enlisting the help of her skeptical younger brother, Eric, her best friend, Savannah, and Howard, their NASA-obsessed schoolmate, Gillian sets off into the ruins of a vast doomsday bunker deep within the earth. But they aren't alone inside its dark and flooded halls. 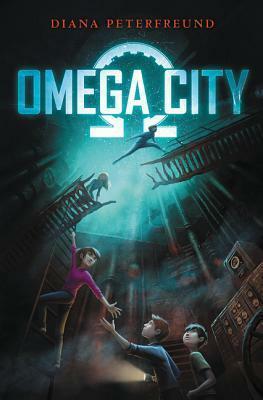 Now Gillian and her friends must race to explore Omega City and find the answers they need. For while Gillian wants to save her dad's reputation by bringing Dr. Underberg's secrets to light, there are others who will stop at nothing to make sure they stay buried . . . forever.